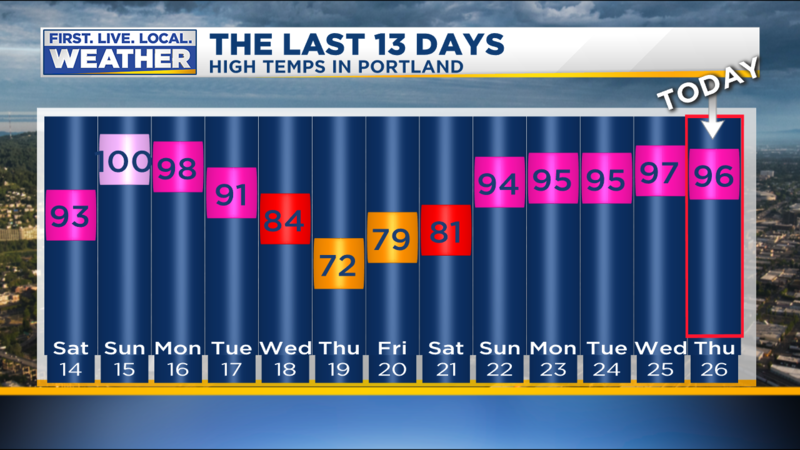 We hit 92 in Portland today, a few degrees below my 95 degree forecast high due to a little more marine air moving inland plus a thick layer of smoke overhead. Notice Kelso/Longview barely made it to 80 degrees! A clear sign that someone has turned on nature’s air-conditioning west of the Cascades, but it’ll take another day for us to drop into the 80s here in the metro area. Today was the NINTH consecutive 90 degree day in Portland, the 2nd longest streak on record. It may have been the last 90 of this heat wave, more on that below. We’ve set a new record for # of 90 degree days in ANY month; the new record is 15 as of today. We’ve never seen so many 90+ days in one month here. When you average all 30 days of the month so far, the temperature of 73.98 degrees puts July 2018 firmly in 2nd place for hottest month of all-time. That’s just barely behind July 1985. Due to a thicker marine layer tomorrow (with some morning clouds), I think it’s unlikely we hit 90 again tomorrow in the metro area…likely topping out in the 85-88 degree range…much better! We sure have a dramatic change coming Thursday and beyond. First we get a huge marine push Wednesday night. Models show the marine layer thickening up to around 5,000′ or so by Thursday AM. A marine layer like that will keep us cloudy and in the low-mid 70s at the warmest point during the afternoon…quite refreshing! Expect a similar setup Friday. 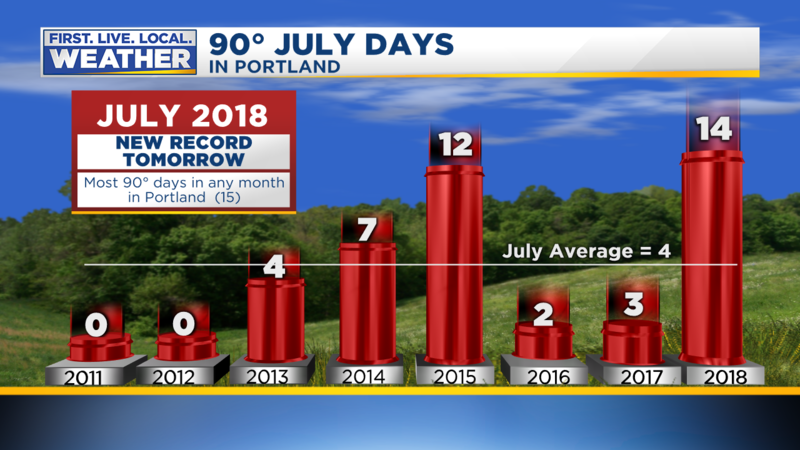 By the way, July ends tomorrow and we’ll set a new record for the driest late spring & early summer on record in Portland (May-July).We’ve never seen it dry out so early in the late spring and remain dry right on through the summer, although 2015 & 1992 were close. Salem records go back quite a bit further in time, yet it’s still the driest down there as well with only 1922 and 1924 close. 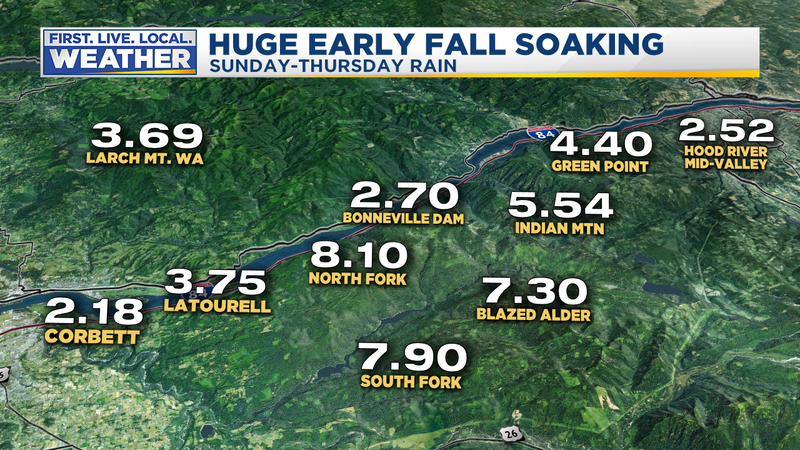 Hopefully we’ll get a “September miracle” downpour again this year like the one that doused the Eagle Creek Fire last year. Of course you can probably guess that we can forget about 90s during that time. Check out the ECMWF ensembles for temperature…below average for most of the time from this Thursday through the following 7 days. Does this mean all of August will be cloudy, cool, & showery? Absolutely not, but it’s very clear the first 10 days of the month will be far different than July! 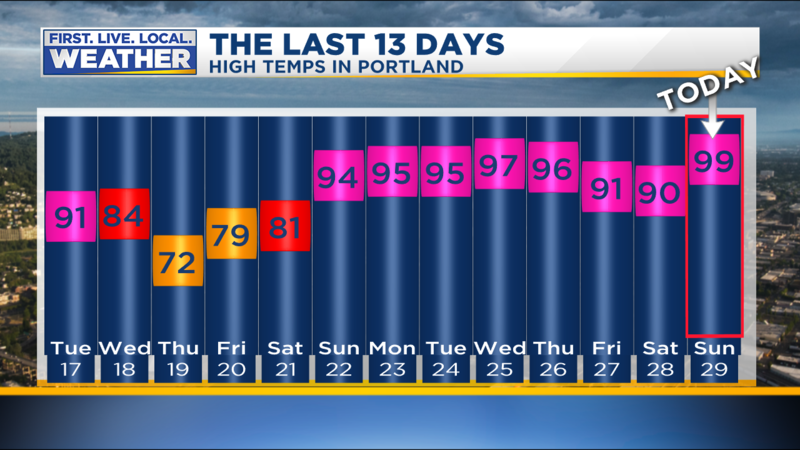 Yesterday was “reasonably hot” but today the furnace went into “hot blast” mode, hitting 99 degrees in both Portland & Salem. It was the 2nd hottest day of summer here in Portland. We didn’t have any offshore flow today, no easterly wind to help drive temps to 100, or higher. That’s been something interesting about both heatwaves this summer; even with weak onshore flow we’ve been able to get close to or hit 100 degrees. 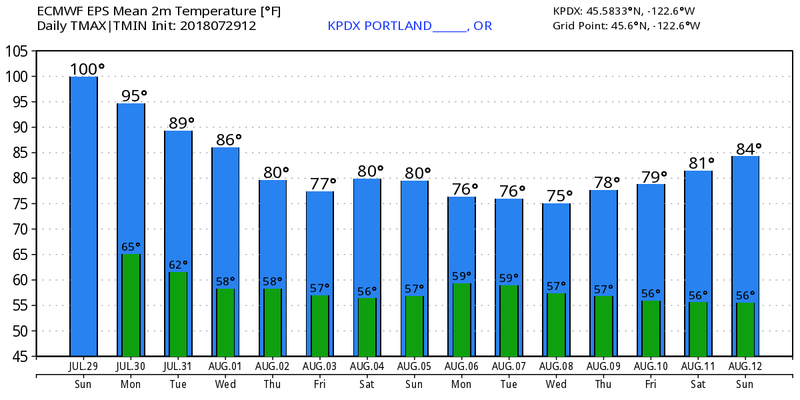 I’ve been forecasting in Portland coming up on 27 years this fall…seems like it’s “easier” to get hot weather nowadays with the same upper-level setups. That said, it was +23 deg. Celsius when the weather balloon hit the 850 millibar level about Salem this afternoon. It doesn’t get much hotter than that. Easterly wind would have pushed us up into the 101-103 degree range. Luckily we didn’t get that. Tomorrow there will only be minor changes. First the upper-level atmosphere cools just slightly. Then the onshore flow should be just SLIGHTLY stronger; although I doubt that’ll change much except drop temps maybe 5 degrees. The 3rd? Fire smoke is on the way. 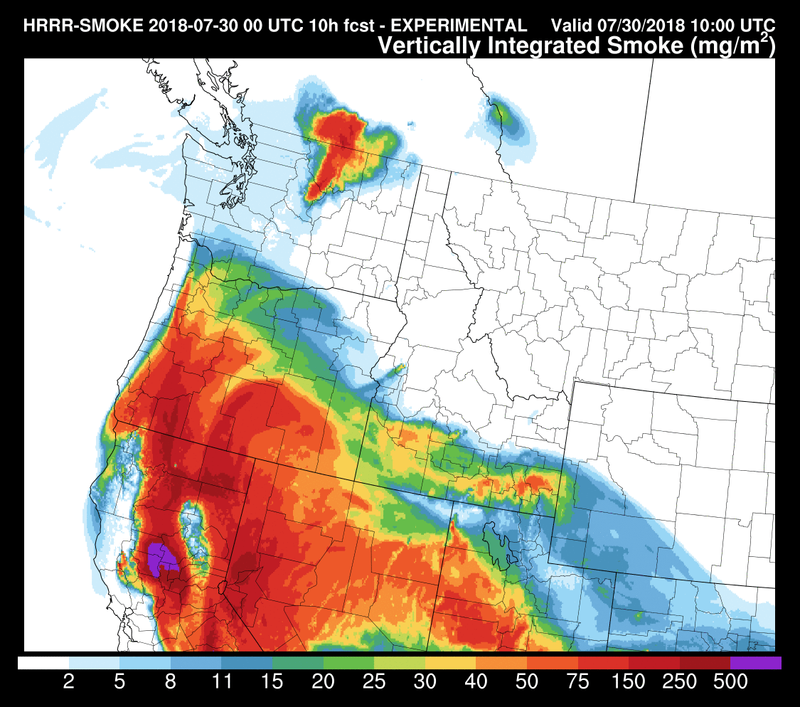 Upper-level wind has turned southerly the past 6 hours, which “opens the door” for all those fires in southwest Oregon and northern California to send their smoke northward. This image is from midday today. But I can now see the thick smoke approaching from the south on our Skyline Camera. Yuck…expect a sickly yellow-ish sun in most of Oregon and the southern edges of Washington Monday. As we saw a couple of times last summer, a thick layer of smoke can drop the temperature well below the forecast high. 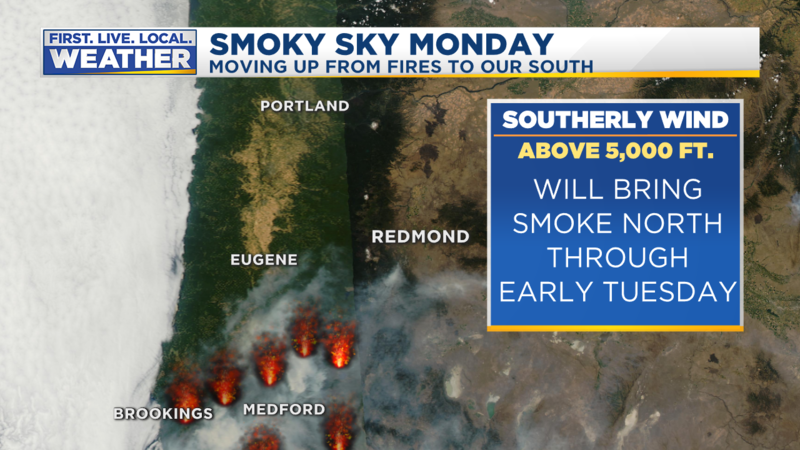 If the smoke suddenly thickens during the night, it could keep us even warmer than forecast during the nighttime hours. We’ll see how that turns out tomorrow. This implies the first 10 days of August will actually be BELOW average with plenty of cloud cover. A huge change. One more thing, 45 of 51 ECMWF ensemble members give us some significant (think spring) showers the early/mid part of NEXT week. It’s centered around the 6th-9th of August. I’ll take a closer look tomorrow, but this could impact agricultural interests that are used to dry conditions in early August. Try to stay cool on Monday! It’s ANOTHER scorcher out there folks. I see it’s 95 on the roof of the FOX-12 broadcasting fortress (business park building). 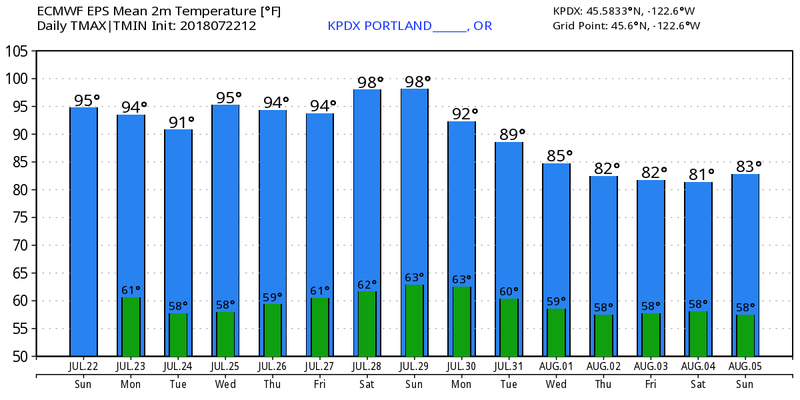 Officially here in Portland we hit 96 degrees this afternoon, that’s our 5th day into the mid 90s. This is our 16th day at/above 90 degrees this summer, we’re headed for 20-21 by the time this heat wave ends! Of course you may be wondering if we’re breaking any sort of “consecutive 90 degree days” record? 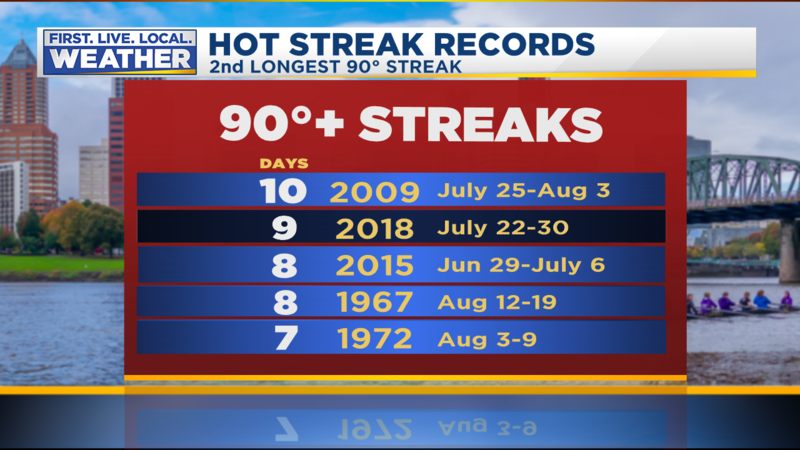 IF the last 90 degree day is Monday, we’ll be at #9. If we still reach 90 on Tuesday, we’ll tie the all-time record of 10 days at/above 90 set during the 2009 heat wave. Remember those back to back 106 degree days? 95 doesn’t seem so bad now does it? 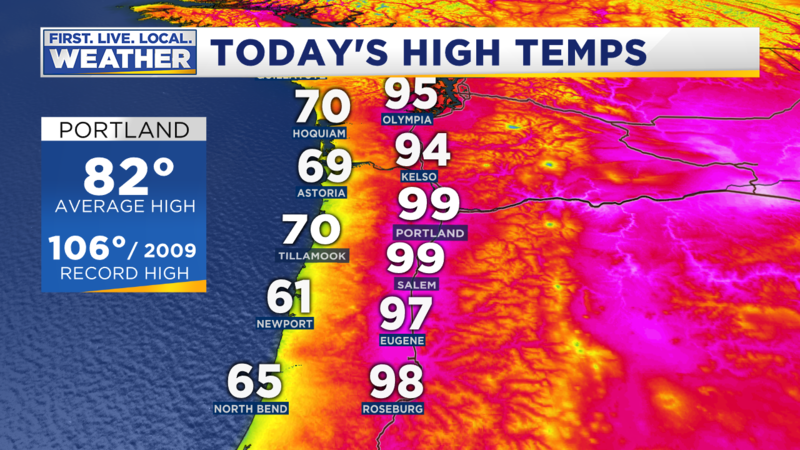 A slight cool-down Friday/Saturday due to a very weak seepage of marine air into the western valleys of NW Oregon and SW Washington…high temps drop closer to 90. Higher relative humidity. Models are all showing rising dewpoints (measure of moisture in the air) both Sunday and Monday. Most likely due to the slight influx of marine air plus southwesterly flow developing overhead as the strong ridge rebounds just to our east. This means not only hotter weather Sunday & Monday but more humid…yuck! Warmer nights. A hotter airmass plus more humidity means our current low-mid 60s low temps will warm another 3-5 degrees. 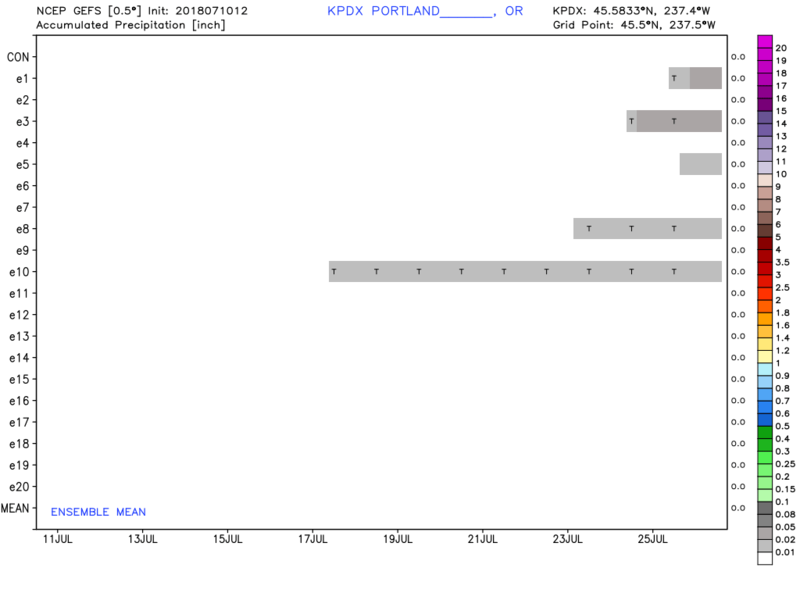 The result will be lows closer to 70 in the Portland urban areas Sunday and/or Monday mornings. 2nd yuck! 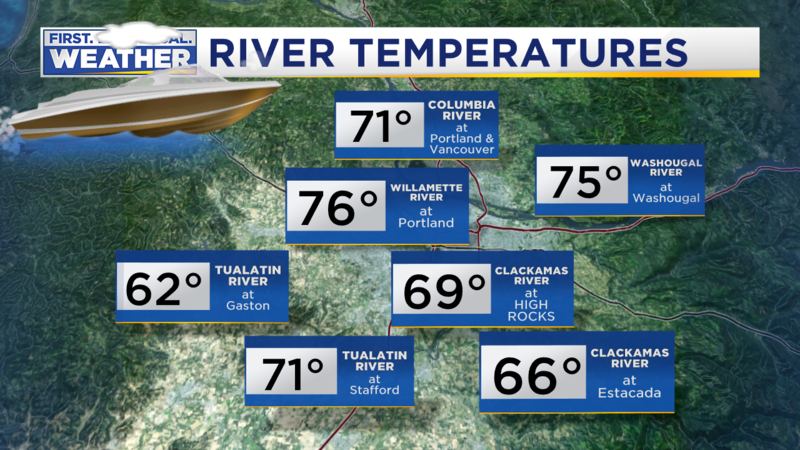 Try to stay cool the next 4-5 days…getting into water is an excellent idea…check out those river temps! It appears what could have been a major problem for future West Coast satellite imagery has been turned into a minor issue…we hope. The first of a new series of advanced geostationary weather satellites was launched last year. It was named GOES-16. After a period of testing, it was moved into the GOES-EAST position off the USA east coast last December. These new satellites have far greater temporal and spatial resolution, plus a bunch of new sensors with new capabilities. In early March a sister satellite, GOES-17 was launched. The plan is for a few months of testing and checkout, then a move to the GOES-WEST position off the West Coast this fall. But once the satellite was launched, engineers discovered a huge anomaly. The ABI (Advanced Baseline Imager) has a “cooling problem”. It’s similar to a radiator not working properly and allowing your car engine to overheat. In May NOAA/NASA announced the Infrared imagery could possibly be unusable for half the day. Specifically at night when the sun is behind the earth and looking directly into the imager. Bad news! Keep in mind that GOES-15 continues to operate faithfully in the GOES-WEST position. But there has been a real possibility that the western half of the USA could be left without a new/advanced satellite for another 2-3 years. 13 of the 16 sensing channels on the ABI should be available 24 hours a day during the solstice periods (summer & winter). The other 3 channels should work at least 20 hours of the day during these times. 10 of 16 channels should work correctly 24 hours a day during the equinox periods (early spring and early fall). You may wonder why it would be different depending on the season? It turns out the sensor runs “coolest” during the solstice times (June & December) when the sun is not pointing directly at the sensor during the night. Near each equinox the sensor more easily overheats with too much incoming solar radiation pointing directly at it from behind the earth. It was also revealed at the press conference today that GOES-16 has experienced a much smaller version of this same problem. Luckily it hasn’t impacted performance on that satellite so far. Due to these issues, most likely GOES-S & GOES-T will likely be delayed as engineers try to fix the cooling issues before launch. They were scheduled to be launched beginning in 2020. The best news? Barring any further problems, GOES-17 will make the move westward this fall and be in place at 137W longitude for this coming storm season. It will be renamed GOES-WEST at that time. It’s probably too early, but I’ll say WHEW!…for now. We are up to #12 already this year with another 7 likely on the way. You aren’t crazy, we HAVE seen a string of hot summers starting in 2014. Of course 2016 was only a bit above average but it has been ridiculously hot otherwise. 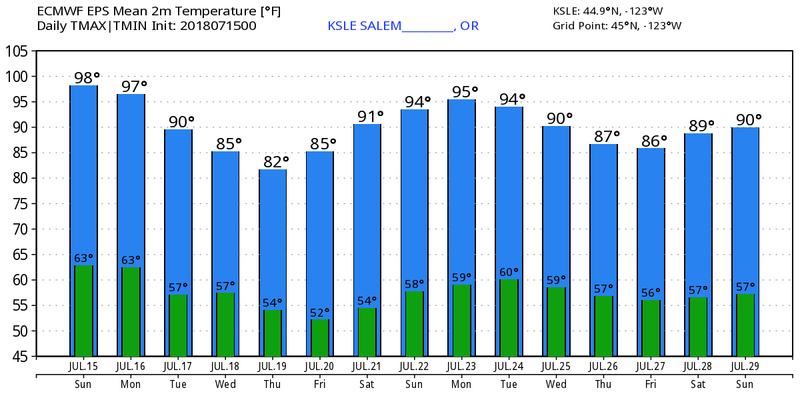 As of this evening, it’s our 4th hottest July on record in Portland, 10th hottest in Salem. Why such hot weather? As mentioned in previous posts this month, upper-level heights have been running quite high compared to normal. A strong upper-level ridge is centered right over New Mexico right now, which isn’t all that unusual for July. It stays there most of the week but then edges closer to us, centered over Nevada/Utah next weekend. That’s why I’ve put in temperatures near 100 again for next weekend. We’ll see how that plays out. Most important, the ridge stays nearby and keeps us continuously hot all this work week without any sort of good marine push to bring us cooler ocean air. That’s a long hot spell, but you also see some sort of pattern change arriving about the middle of next week (we hope!). 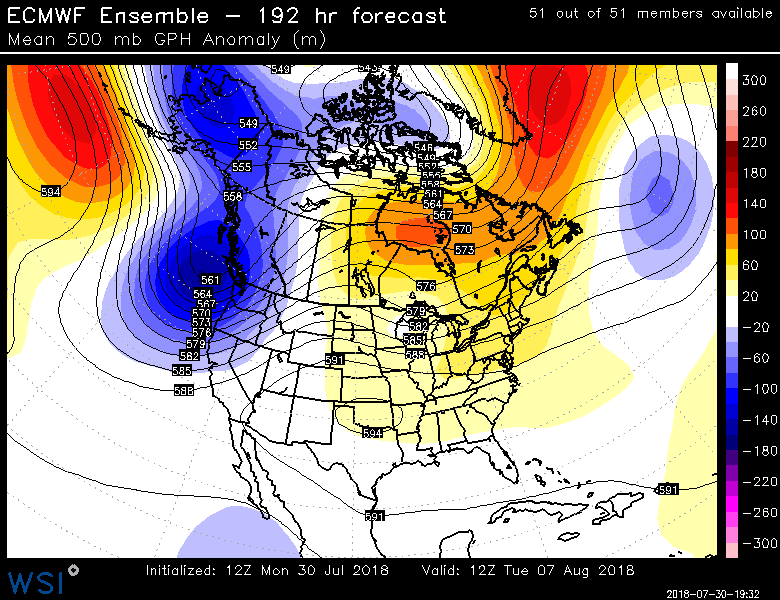 Just as August arrives the ridge seems to want to weaken…maybe. 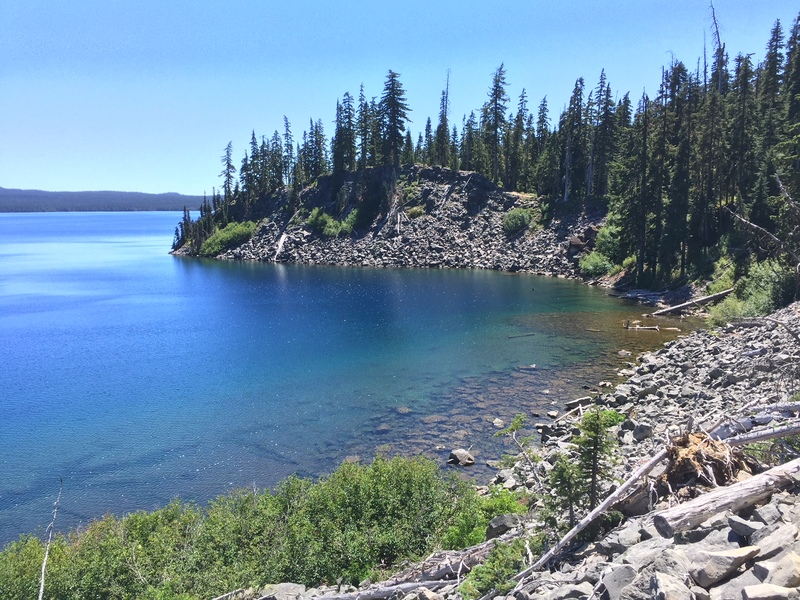 By the way, my family and I just spent two days at Waldo Lake…hadn’t been down there in almost 10 years. That’s the 2nd largest lake in Oregon and typically real chilly, but perfectly clear. We got lucky; the heatwave has warmed up the surface to at least 65-70 degrees, maybe even a bit warmer along the edges. What a beautiful place with no motors and so peaceful as well. Mosquitoes weren’t horrific, but definitely around. 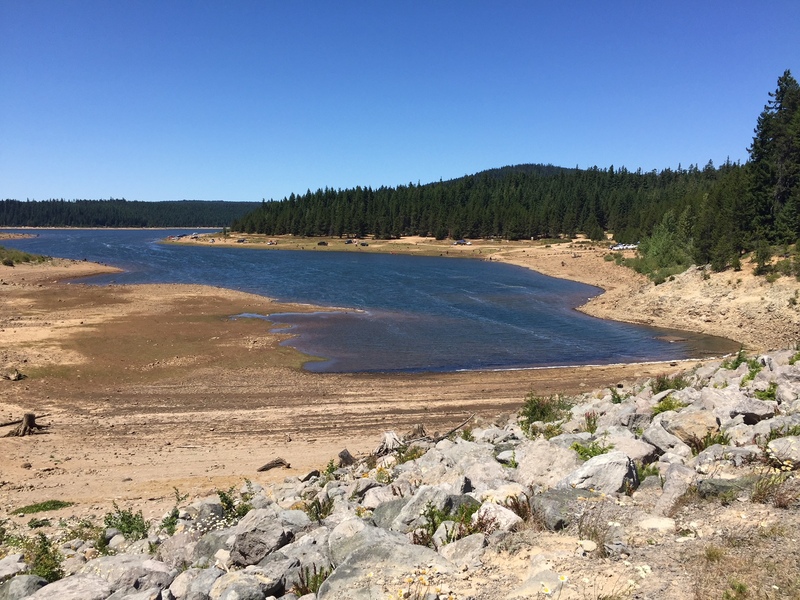 As always August is better at Cascade lakes mosquito-wise. Then we spent two nights at Clear Lake…getting pretty low early again this year. Won’t be much left in a few weeks up there, I was almost able to walk across the wide section. So many beautiful places to visit but just not enough time!…maybe in retirement. 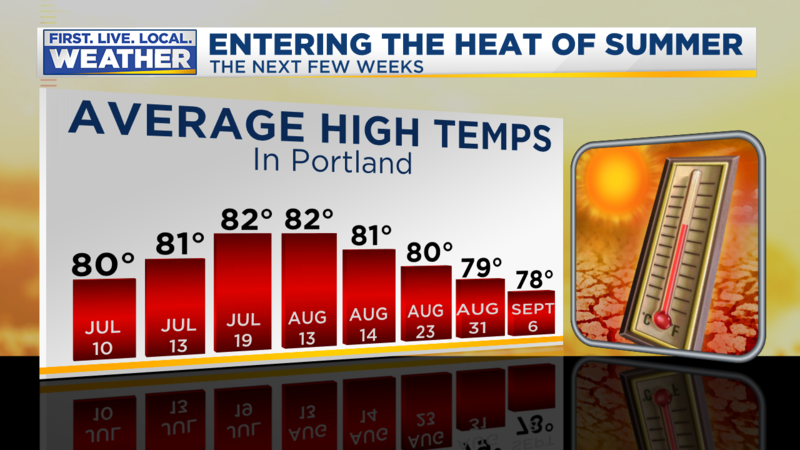 Just a quick note to let you know today looks to be a scorcher again, possibly the hottest day of the year in Portland. For the first time in 3 days light easterly “offshore” wind flow has developed this morning through the Gorge. That plus a very warm/hot atmosphere overhead and full sunshine means warmer temps than the low 90s from Saturday. 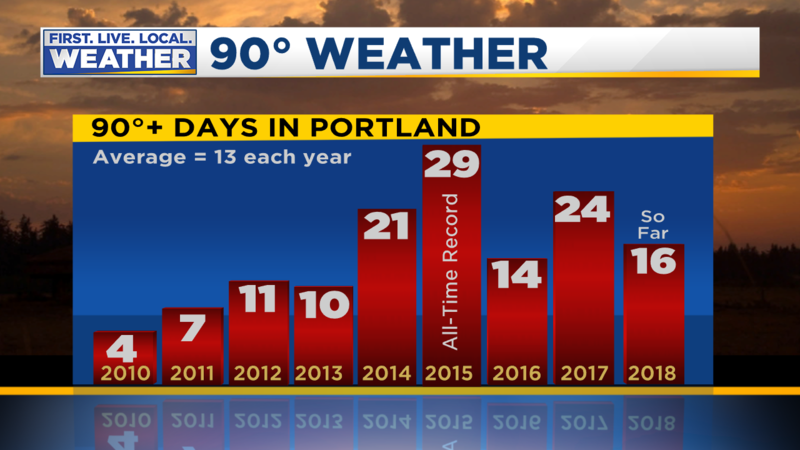 PDX officially hit 93 yesterday. 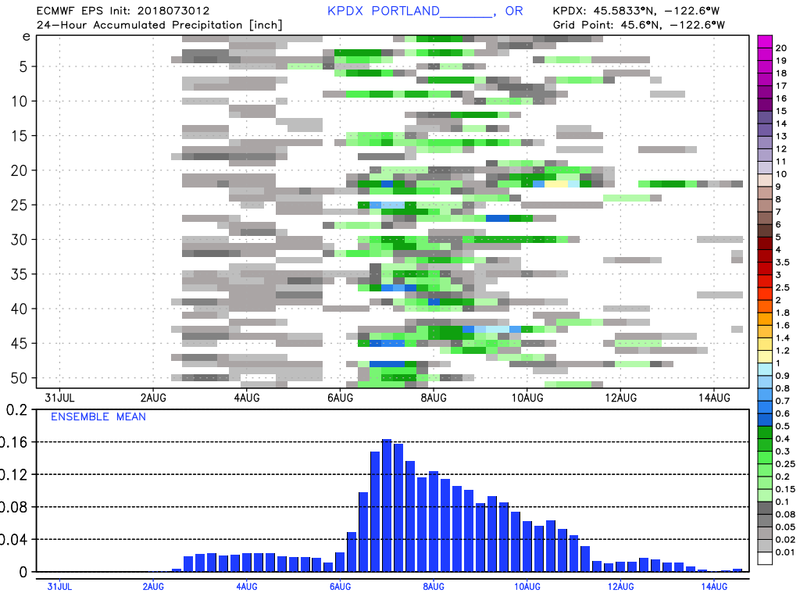 850mb temps are not as hot as I’d like to see for PDX hitting 100, currently around +20 to +21 over Salem. It’s a stretch to get that hot down here at the surface with those temps up above. 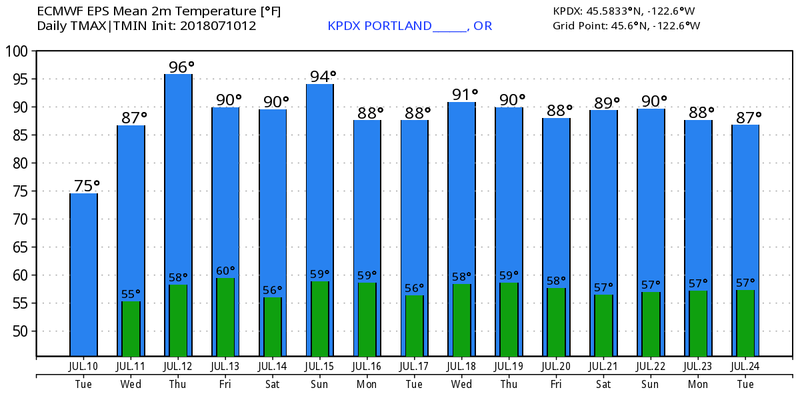 But considering the sudden surge of heat Thursday with the offshore wind (97 at PDX and 99 at Troutdale), temps around 100 seem reasonable again today. 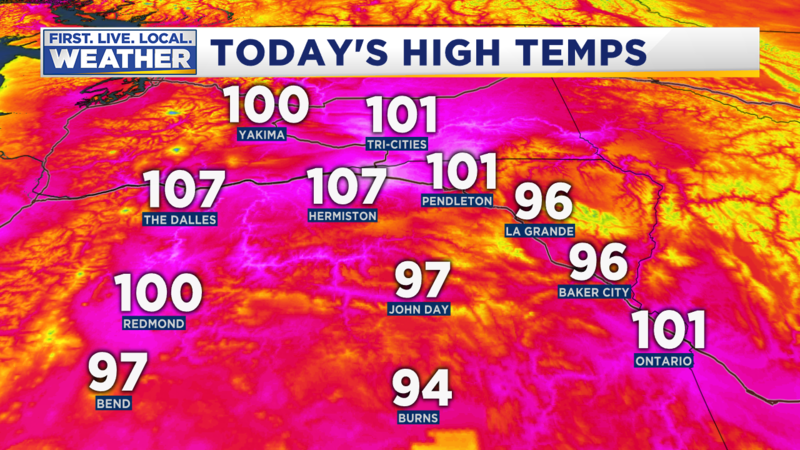 It sure seems easier to get hot in the Willamette Valley & Metro nowadays doesn’t it? It’s going to end up as another blazing hot July; Portland, Salem, & Redmond are all running 3 degrees or more above average for the month at the halfway point today. 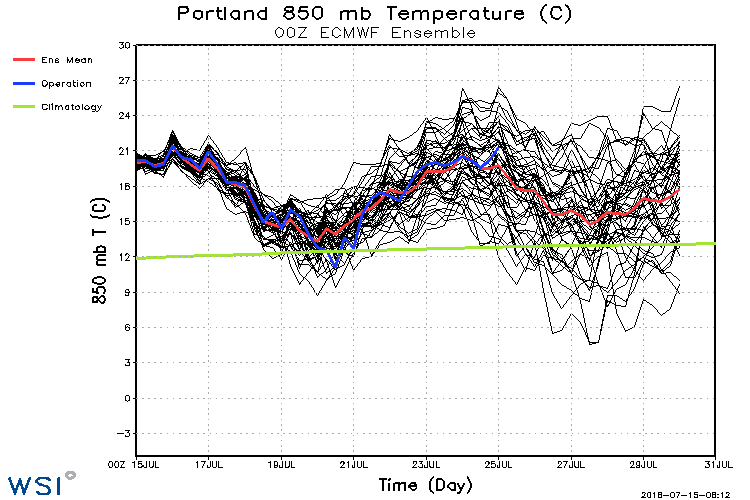 Note the 850mb ensemble chart from the ECMWF shows upper-air temps above average the rest of the month. 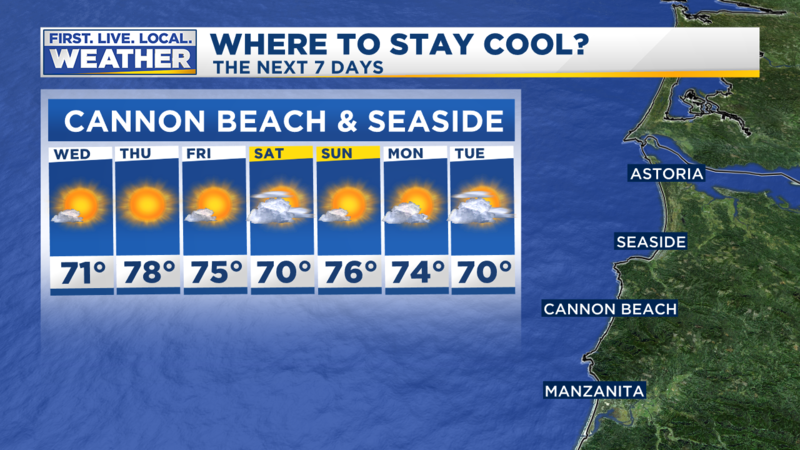 I’m on vacation this week, looking for a cool place…stay cool! Today was a fantastic day in my opinion…clouds to sunshine and temperatures right near seasonal averages. 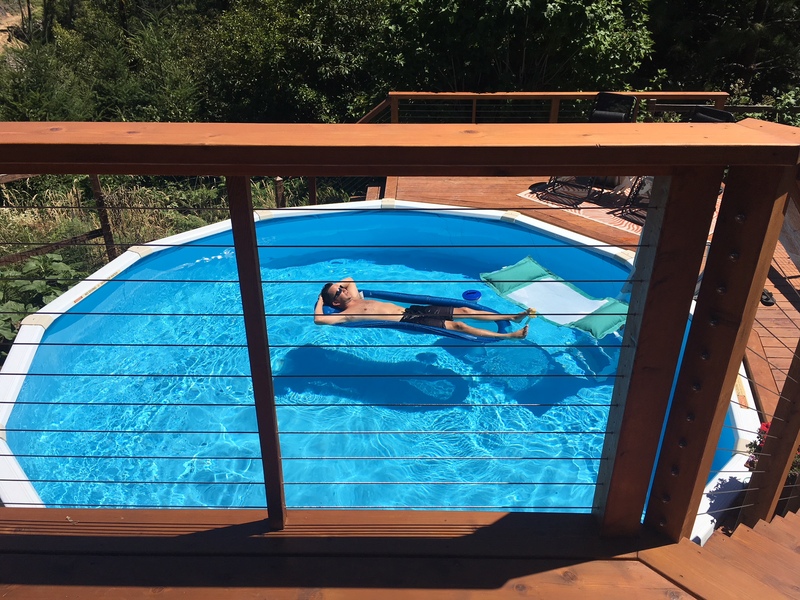 The Willamette Valley ended up right around 80 degrees. 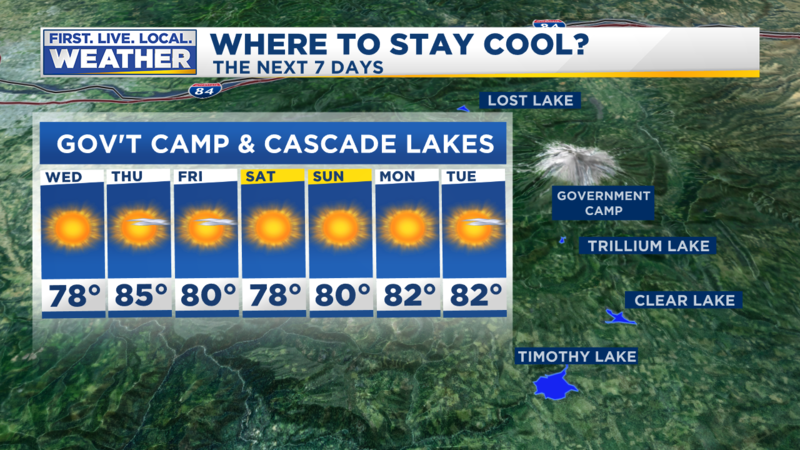 If you don’t like our mid-summer hot weather, find a cool place; it’s about to get hot west of the Cascades. A sprawling upper-level ridge is already building this evening over the Pacific Northwest and more or less remains over us the next 7-10 days. A long period of very warm to occasionally hot weather is likely Wednesday through the middle to end of NEXT week. Every day is likely to exceed 85 degrees, with temps as high as 95 either Thursday or Sunday/Monday. Record highs are unlikely…all records through the 21st are at/above 101 degrees. This one is interesting because it’s not a sharp ridge which gives us extremely hot weather and/or easterly downslope wind. Instead it’s quite flat, indicating a large area of much warmer than normal temps. Here’s the 500mb forecast from the ECMWF model ensembles (actual heights are the lines, anomaly is the color) for Thursday, Sunday, next Wednesday, and Saturday the 22nd. 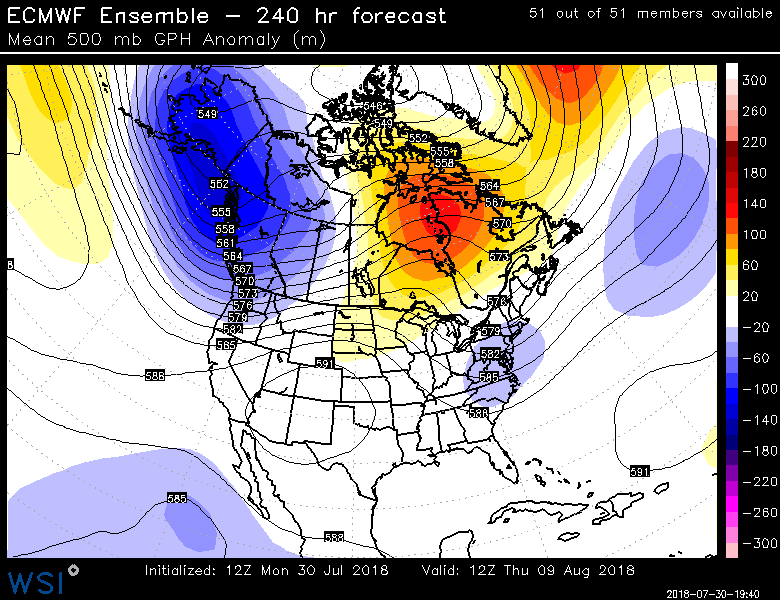 No big, hot ridge, but abnormally high heights…seems like a lot of red across a good chunk of North America. 850mb temps peak out around +22 Thursday and 19-21 on ECMWF ensembles Sunday-Monday. Without decent offshore flow it’ll be very tough to get above 95 degrees (good!). These numbers are a good 8-15 degrees above average for our area. If you are into water sports this is excellent news. If you work for a paving company…well…October will eventually get here. We can forget about precipitation because in this pattern even thunderstorms are hard to come by as high heights squash the convective stuff. 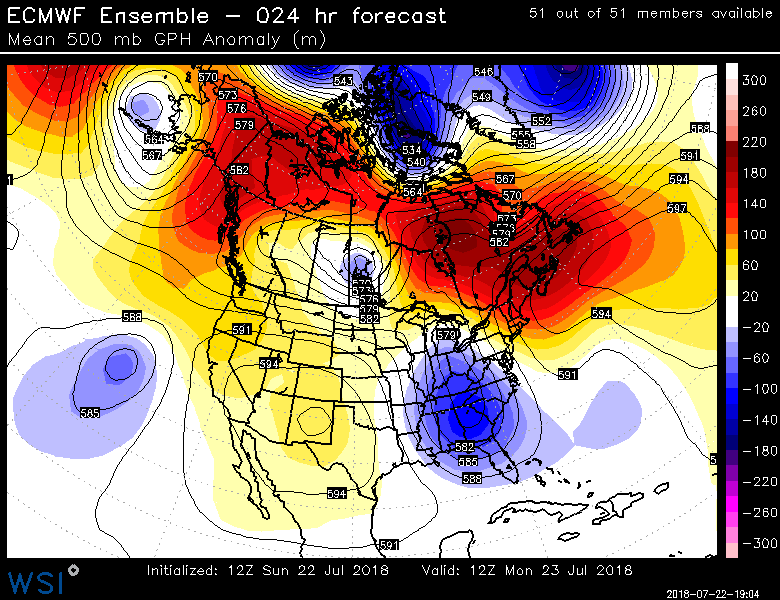 Not a single GEFS ensemble member produces even .10″ rain in the next two weeks. The ECMWF is similar. Of course if we’re going to get an extended very warm to hot stretch this IS the time to do it. 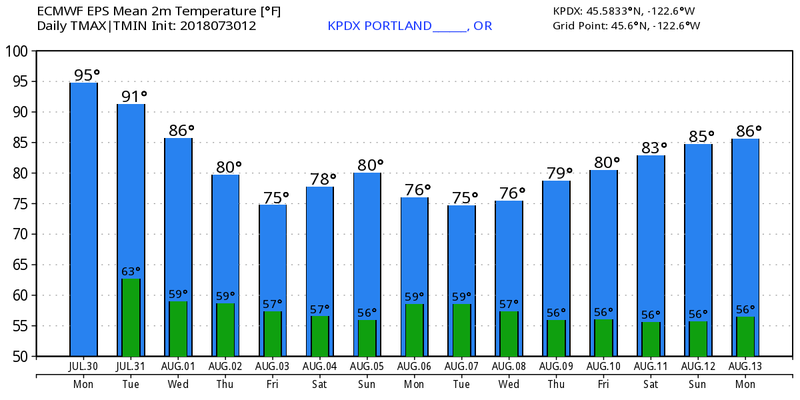 Notice that here in Portland the hottest time of the year is typically the 3rd week of July to the middle of August. I would suggest Ape Cave or any other lava tube near Trout Lake or Bend…it’s in the 40s year-round in most of those cave since they follow the ground, not air, temperature. 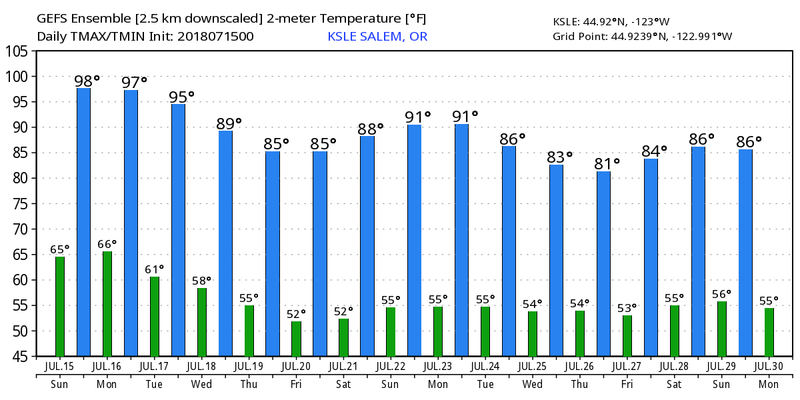 On a “big-picture” note…unless something changes drastically in August, this is going to be our FIFTH warm/hot summer in Western Oregon and SW Washington. I can’t find any other period in at least the last 100 years where we’ve seen such a stretch of abnormally warm weather. 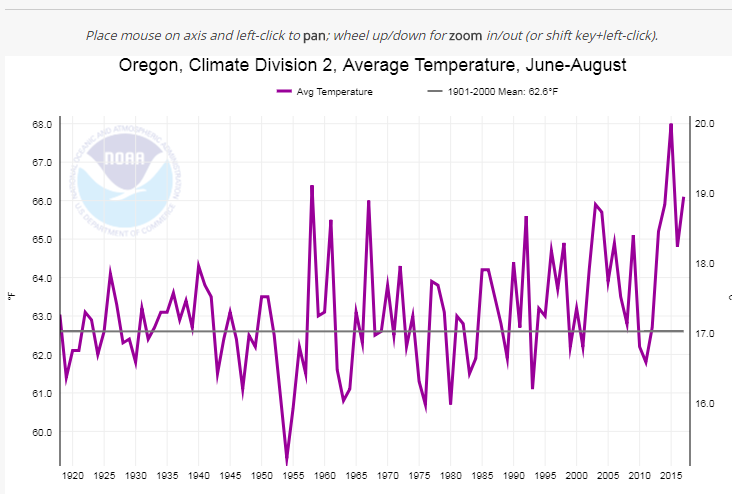 2015 was the hottest summer on record here in Portland. As mentioned in the past, this is one season in which we are seeing dramatic warming in our area…not so much in winter but in summer. That doesn’t mean we can’t have a round of cool summers right around the corner, but the trend is definitely up. That cool summer of 2011 seems a long way back now doesn’t it? You are currently browsing the FOX 12 Weather Blog blog archives for July, 2018.